As health- and quality-conscious consumers increasingly seek out fresh fruit and vegetables, participants in the food supply chain--growers, shippers, processors, and retailers--must be ever more effective in safeguarding their products and protecting consumers. 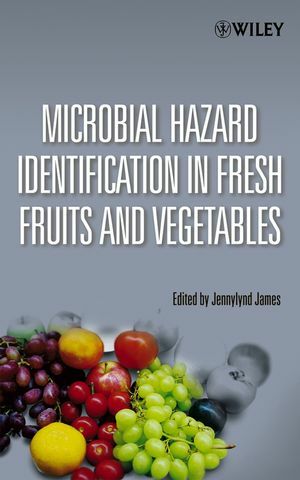 Microbial Hazard Identification in Fresh Fruits and Vegetables is a comprehensive guide for the fresh fruit and vegetable industry to understanding and controlling the hazards that can affect their products on every leg of the journey from farm to fork. From production, harvesting, packing, and distribution to retail and consumer handling, the text highlights food safety hazards and potential areas of microbial contamination, examines food-borne pathogens and their association with produce-related outbreaks over the years, and points out areas for further research to better understand the survival of pathogens on fresh produce throughout the food chain. JENNYLYND JAMES, PHD, was a technical manager at the Irish company Keelings Multiples and is now a Food Consultant based in Dublin, Ireland. Before moving to Ireland in 2004, Dr. James worked as the Senior Manager of Corporate Quality Assurance at Dole Food Company in Westlake, California, where she established food safety programs for tropical fruit operations in Latin America. Previously, she served as Director of Research & Development and Product Safety at Boskovich Farms, Inc. She received both a BSc in biochemistry and a PhD in food science from McGill University, Canada, as well as an MSc in food technology from the University of the West Indies, Trinidad and Tobago. Dr. James has published several peer-reviewed articles in Critical Reviews in Food Science and Nutrition, Journal of Food Biochemistry, American Journal of Enology and Viticulture, and the Journal of Food Quality. 2. The Epidemiology of Produce-Associated Outbreaks of Foodborne Disease. 4. Produce Quality and Foodborne Disease: Assessing Water’s Role. 6. Overview of Hazards in Fresh-Cut Produce Production: Control and Management of Food Safety Hazards.